Line tool: Produces a straight line at any angle. To use the Line tool, click and hold the mouse button, drag, and release the mouse to create a line. To constrain the angle to perfectly horizontal, perfectly vertical, or 45-degree lines, hold down the Shift key while drawing the line. 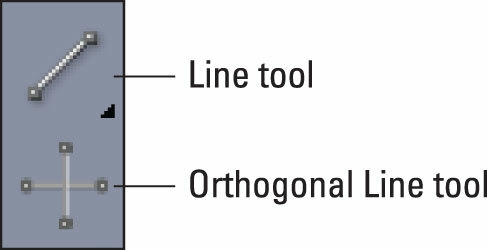 Orthogonal Line tool: Produces only a vertical or horizontal straight line and lines at a 45-degree angle. Chances are, you’ll want to do more with your lines than simply plunk them down on your layout, so keep reading for more details about working with lines. To change the line thickness, style, color, or transparency, or to change the line to an arrow, you can use either the Style menu or the controls in the Home (Mac) or Classic (Windows) tab of the Measurements palette, as shown. The following sections give you the details. Click the up or down arrow on the left of the Line Width field. Each click changes the width to the next preset size. Click the Line Width field and type in a new width. To use inches, centimeters, or millimeters instead of points, enter the unit after the number. For example, enter .25″ for .25 inches, 1cm for 1 centimeter, or 5mm for 5 millimeters. 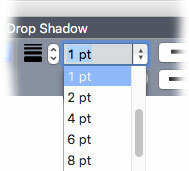 QuarkXPress converts the value to points when you leave the Line Width field. Click the up or down arrows on the right end of the Line Width field and choose a preset width from the menu that appears. One of the width presets is Hairline, but it’s best to avoid that one because its printed width varies with the output device. On a PostScript imagesetter, for example, the width is .125 pt; other printers usually print a hairline as the thinnest line they can print. Instead of using the Measurements palette, you can choose preset line attributes from the Style menu. However, you can’t enter your own values as you can when you’re working in the Measurements palette. 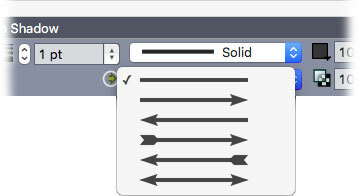 QuarkXPress offers several time-tested line styles, and you can add new ones by choosing Edit → Dashes & Stripes. 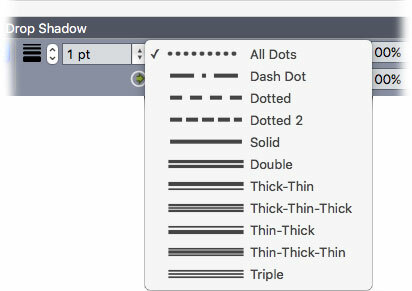 If you choose a dotted or dashed style, you can customize the color and opacity of the spaces between the dots or dashes (the “gap”) with the controls that appear at the right of the controls that you use to set the color and opacity of the solid dots or dashes, as shown. To make an arrow, choose a style from the Line Arrowheads control shown. Note that some have tail feathers and others don’t, and the last one has an arrowhead at both ends!